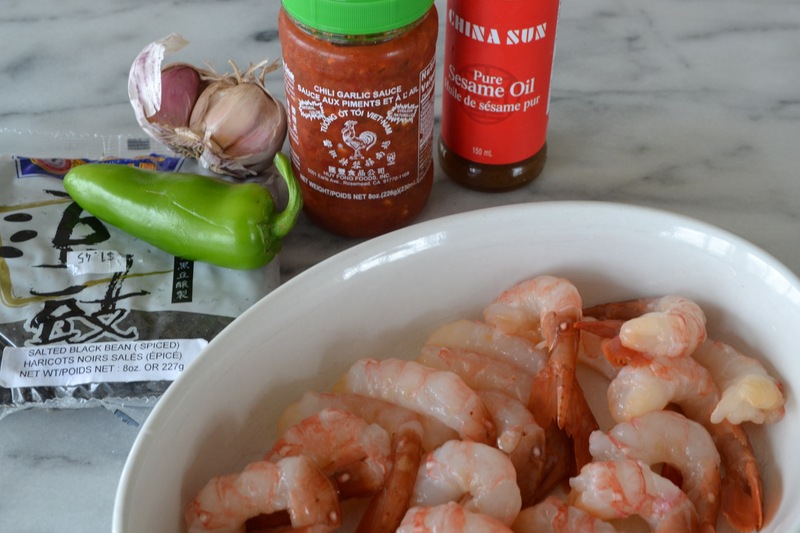 With our local BC Spot Prawn season in full swing (May-June), I am testing some new recipes and going back to past favourites. To me, these prawns taste sweeter and cleaner than the tiger prawns that come from faraway places, and since they are also available frozen off-season, they are my choice year round. If you have the fortitude to buy them alive and still wiggling, you will probably want to sauté them quickly, still with shells and heads on, or throw them on the barbecue. Key word here is ‘quickly’ or they will be dry and less appetizing. Then peel them and dip them in a flavoured butter. It is more of a chore to peel the just-off-the-boat prawns but if you are cooking them the day after they are caught, or if they have been frozen and the shells come off more easily, this pasta dish would be a fine choice. A little background about this recipe: Back in the 80’s, there was an innovative restaurant on 4th Avenue called the Santa Fé Café, which was one of the first to introduce Vancouverites to the flavours of fusion cuisine. This prawn dish was a standout and several people I know have been creating their own versions at home ever since. My cousin and favourite kitchen accomplice, Daphne, told me recently that she has been making it for her family about once a month since I shared the recipe with her a long time ago. I then called my friend, Sandi, who years ago imagined with me how we might replicate this dish after enjoying it together at the restaurant. She told me how she prepares it now and how her family loves this quick and tasty one-dish meal. So here is my version of our old favourite, to which I added some beautiful fresh asparagus. Cook the linguine until almost done, then add the asparagus and cook until both pasta and asparagus are al dente. Remove, drain, and toss in a bowl with 1 T. sesame oil. Set aside while you cook the prawns and sauce. In a large wok, stir-fry the prawns and the garlic in 2 T. vegetable oil until barely cooked, then remove mixture to a plate. In the same wok, add 2 T. oil, the jalapeno pepper, red onion, black beans and chili paste and cook for about 1 minute. Add the chicken broth and soy sauce and simmer to reduce slightly. 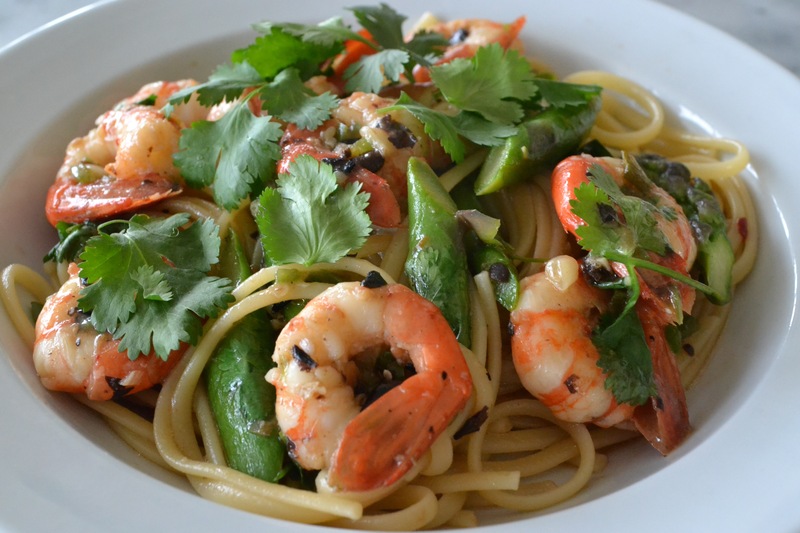 Return pasta, asparagus and prawns to the wok. Toss over the heat until well mixed and hot. Taste and adjust seasoning by adding more soy sauce, chile sauce or sesame oil. Portion into bowls and garnish with cilantro sprigs. Makes 4 servings. This looks amazing! I’m really glad I stumbled upon your blog… I’m always on the lookout for new seafood recipes. My husband is a commercial fisherman (we live just south of you, in Bellingham) so we eat a lot of seafood. Can’t wait to try this one! I’m so glad we are connecting – I just took a look at your blog, Robin, and I will keep checking back for your seafood ideas. I so admire your energy and dedication to keeping the home front nourished while your husband is out looking after that growing market for wonderful seafood! Thanks for being in touch, Karen, even at this busy time for you. By the way, yesterday I discovered spot prawns, cooked and peeled, at Seafood City on Granville Island…I have never seen them sold this way before. Not an option for this recipe, but they would be such an easy, if more expensive, addition to a main-course salad.